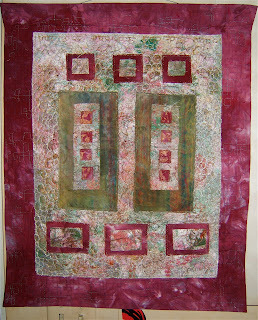 Two quilts I've been working on for the Smoky Mountain Quilt Guild Show have pinks and oranges as the featured colors. 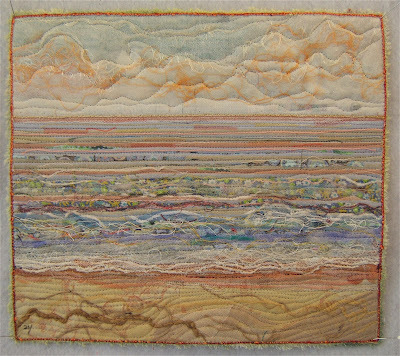 This prompted me to begin this segment of the Lake series with those colors. Now, back to finishing the last one of my three entries for that show. 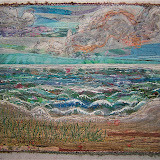 To view the previous 25 quilts in this series, click on the album Lake Series I in the sidebar. 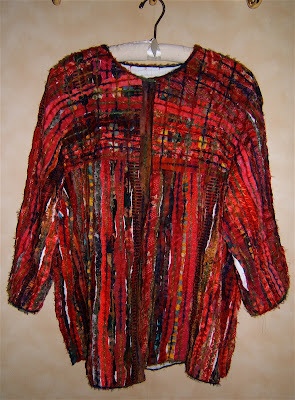 A project that my friend Alicia and I had fun with when she visited last year was to embellish purchased shirts with strips of fabric. Hers is a linen shirt with a damask weave. 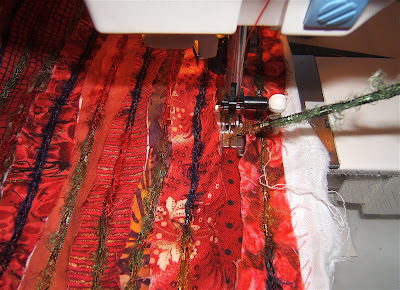 We had pulled all the red fabrics from my stash and rotary cut wavy strips in various widths. These were put into a laundry basket and drawn at random to decorate our shirts. The underarm seams were opened so the garment would lie flat. 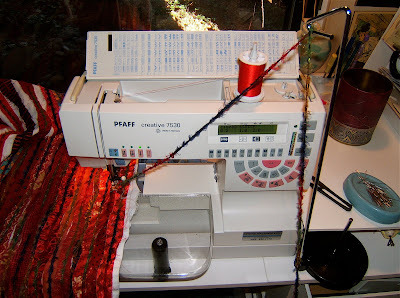 The red strips of fabric were sewn to the shirt by couching yarn down the center length of the fabric strip. Since posting my tutorial for couching yarn, I've added another tool to free up both hands. The thread stand meant for feeding thread off big cones works well to hold the yarn in the correct position for couching it down the center of these strips. I had purchased a light-weight plain weave linen shirt to make my jacket. My initial intention was to space the strips much like Alicia's shirt. However, it "told" me otherwise. 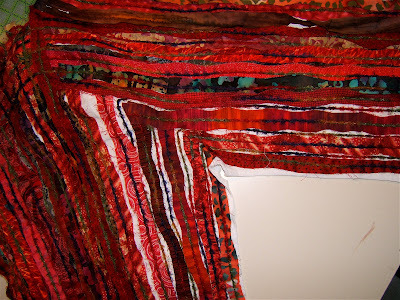 Initially I couched yarn to the linen between the strips. I ended up going back to fill in all the spaces. This meant going into my stash and cutting more fabrics. So, I pulled fabrics that went with the reds. 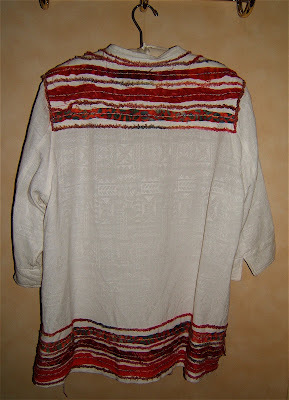 It also indicated that it wanted to be a jacket rather than a shirt. If I had known this up front, I would've looked for a colored shirt. Red, orange, pink, or even black would've been great. The edges of my jacket are finished with couched yarn. I did this two times on each edge to stabilize them as well as for a more substantial finish. I ended up using a whole skein of yarn. 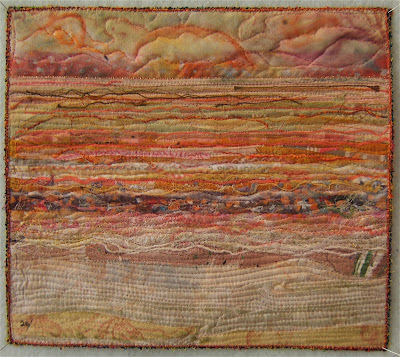 I love the texture of the raw edged strips and couched yarn. This 3/4 sleeve length jacket is light-weight for wearing in the Spring and Fall here in Knoxville and cool summer evenings in Michigan. Earlier this month Deb of Red Shoe Ramblings posted a request on Connections for bloggers to feature photos of their hands. 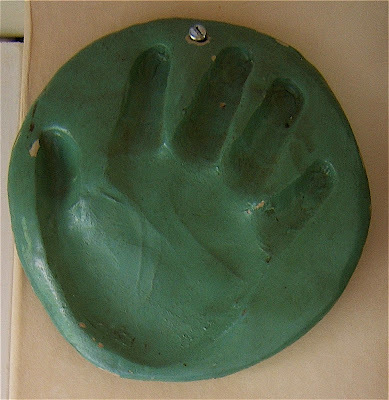 The clay impression of my hand came to me a few years ago. It is one of the very few items from my childhood that I possess. A few moments ago I took a picture of that same hand which made the indent in that clay sixty years ago. Those two pictures represent my life of making stuff. I could end this post here, but I'd like to add another photo of that hand in action. Five years ago a friend photographed my hand while I was quilting my first crinkle quilt, "Ode to the South Pacific". I don't usually wear rings and bracelets when quilting. 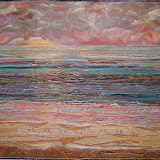 This picture was taken while on a long weekend vacation and I was sitting and chatting and quilting. 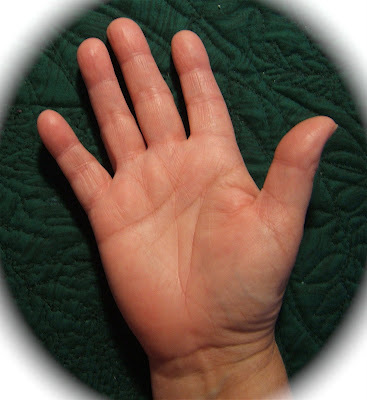 I wear a latex finger that's cut off a glove on my thumb when quilting or doing any hand sewing to easily grip and pull the needle. I prefer cloisenne thimbles, because I like the sturdiness and weight and the inside is enamel ... plus they are beautiful. 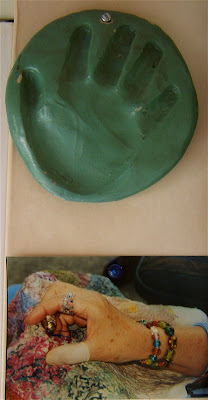 My child hand impression and that photo taken sixty years later hang together in my studio. 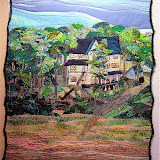 Now, I had better get my hands busy completing my quilt entries for the Smoky Mountain Quilt Show. Recycling is major to Earth Day. 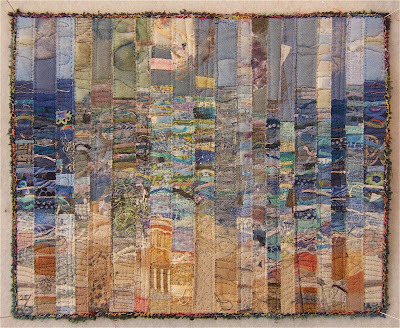 To honor this, here's a collage made up of the cut-offs from the first twenty-four quilts in my Lake series. I consider this to be recycling the recycled. 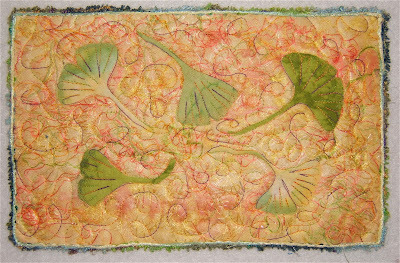 Scraps of fabric and threads from my and friend's quilt projects make up the materials for the pieces in this Lake series. 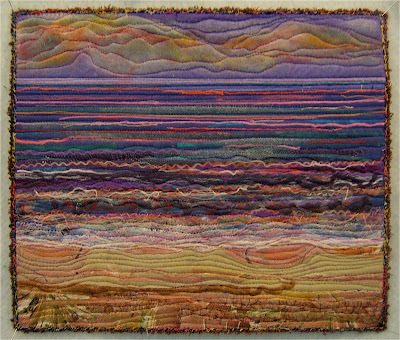 This abstract Lake quilt is composed of the edges I cut off to get each of the first twenty-four to a standard size of 13" wide. 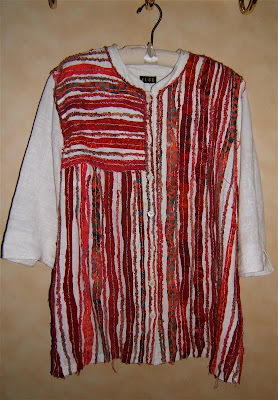 Also, the backings are recycled decorator fabric samples or old curtains while the batting is comprised of old blankets. So far, I've used scraps from an old army blanket and have cut up an old plaid stadium blanket. 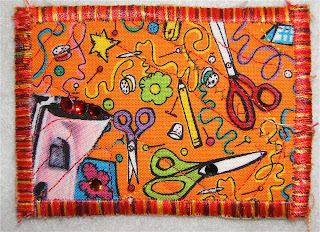 I could hardly wait to get home to create this one with the scraps given to me by my friend Pat at bee this last Thursday. 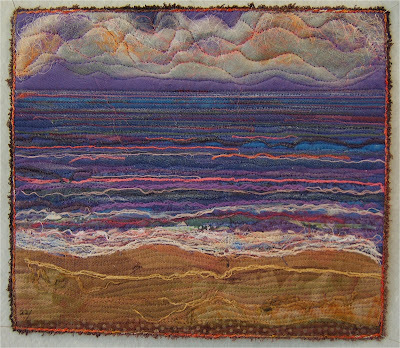 I so very much liked the deep purples of Lake #22 that I needed to make another before continuing this series. 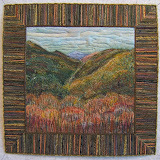 To view all twenty-five quilts, plus photos of each before they were quilted click on the Lake Series I photo album in the sidebar. I've come to recognize that my state of mind or reactions to events are expressed in this Lake Series. The previous posting of Lake #22 reflected my feeling about the horrendous tragedy in Virginia. Previous to that event we had a freezing cold rainy spell for more than a week. All tender new leaves plus blossoms and buds were frozen. 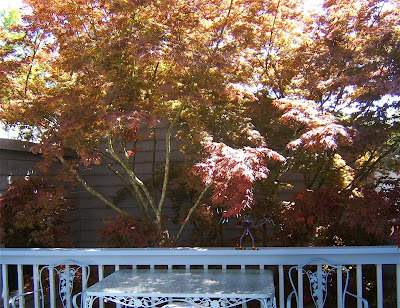 This Maple tree is in the courtyard outside my studio. Most of March was so beautiful and warm. 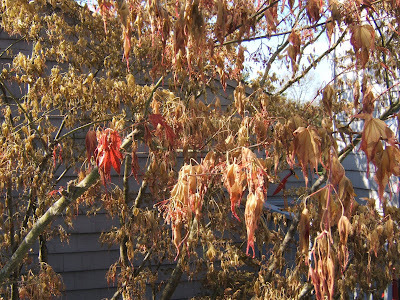 Leaves popped out earlier than usual and the tree looked like this before three nights of below freezing temperatures. I felt sad about losing all the new growth on so many trees and shrubs let alone the blossoms being nipped in the bud. 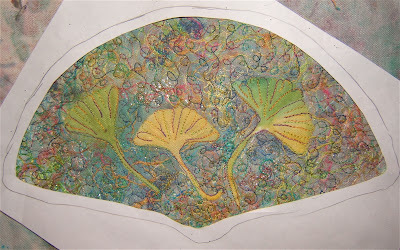 I could hardly bear to look outside, so I retreated inside myself and created a series of light and bright Lake pieces. My state of mind was different from the last time I felt depressed about being sick. 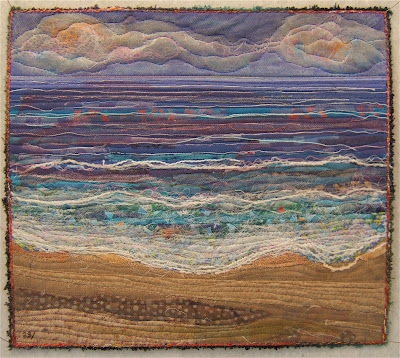 At that time I made three stormy lake quilts (#'s 14, 15, and 16) because I just couldn't make sunny days. Then, I was expressing how my whole being (emotional and physical) felt. My reaction to the frozen and shriveled world was to escape and make a bright sunny one. In fact, these four almost glare they're so bright. To view all the lakes in this series, plus the contruction photos for #'s 18 thru 22, click on the Lake Series Album in the sidebar. My heart is heavy with the senseless loss of lives. I feel a darkness, but desire to honor those who were killed with color and brightness. Since you've seen a bit of my studio in the previous posting, I thought I'd share some of the other items that bring good vibes and energy to my work space. 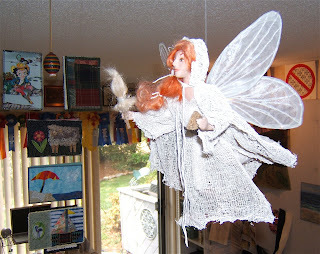 Hanging with the mobiles is an artist-made fairy that was a gift from my friend, Alicia. I'm fond of her red hair ... a color that I would've liked my hair to be when I was young. 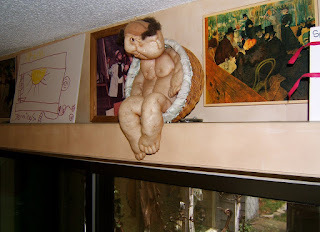 This naked little guy also came from Alicia (back in the 70's). He's keeping watch over all and he just makes me smile. 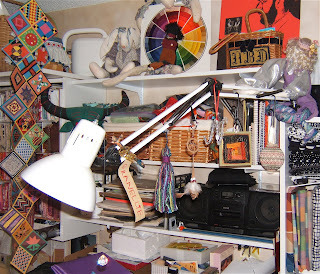 Also, up there is the sewing machine drawn by my grandson, Jennings. 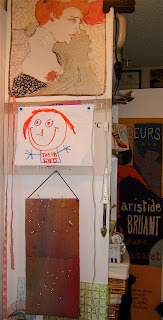 A self-portrait of my granddaughter, Tessa, keeps an eye on my design board ... note the red hair ... and Toulouse Lautrec's red headed lady. 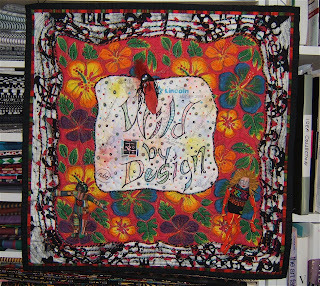 Hanging under Tessa's drawing is my design board pin cushion. 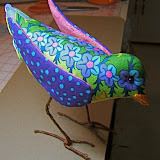 It's made with a favorite piece of fabric from my one and only dyeing session. It embodies the joy and excitement I experienced with friends who were new at the time. Now they're all dear "old friends". There are also photographs of the people who are meaningful in life. My grandchildren, mother, mother-in-law, best friend, and my nephew in his studio are in this grouping on top of a fabric cupboard. Other photos are scattered and tucked elsewhere. There's also a doll with a quilt doing cross-stitch up there. She was a gift from my brother. I have a fondness for dolls so there's a number of them scattered around the studio. The one holding the lamp was made by my mother. The bunny, color wheel, and smocked potpourri ball represent many years of my life. 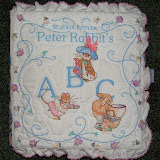 The monogrammed needlework basket was made by a sister-in-law. The embroidered water buffalo is a memento from a memorable trip to Thailand. 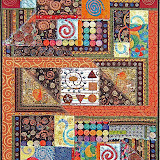 The hanging featuring traditional quilts reminds me of the long chain of quilting tradition in which I'm only a link. Hanging off the lamp there are mementos from friends, a happy stick created by grandson Winston, plus a tassel I made of yarns inherited after the death of my artist friend Betsy. 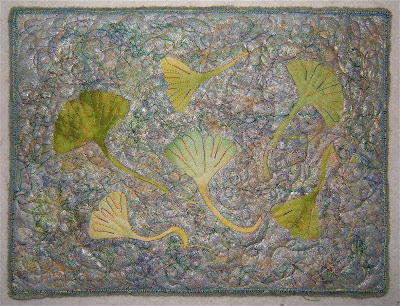 This wall hanging was a birthday present from Gayle. 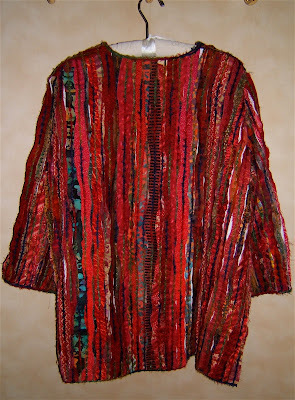 The green fabric was a clean-up rag of hers that I had coveted for a long time, never dreaming that she'd give it to me ... particularly in this wonderful creation. It's an especially important connection between us since that she's moved to Florida. I very much miss playing with her ... especially in the studio she left behind. 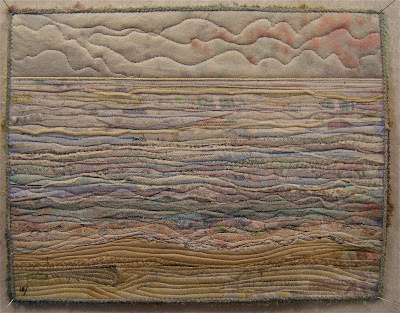 This piece represents the 2003 conference by that name which I attended in Lincoln, Nebraska. I came away from it with a reinforced philosophy of sharing my skills and knowledge ... of mentoring. It features the "buff" that everyone in our group from Knoxville wore and the piece of fabric we all autographed before flying home. What I call "wild women" pins that were gifts from friends are displayed on it. I love being in this room. It is never lonely. I have all that PLUS even more ... including Michael Angelo's David, Toulouse Lautrec, and Elvis. And then there are the wanderings in and out of my husband and our two dogs throughout the day. 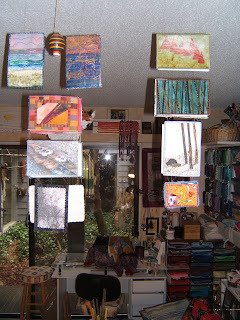 My studio is full of more than just the supplies and tools to make quilts. Here are a few more treasures that have been presented to me. 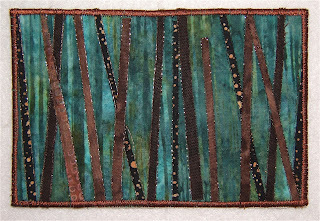 Kay sent this postcard based on the trees in the woods she views from her windows. I love the winter feeling and shadows she's portrayed. 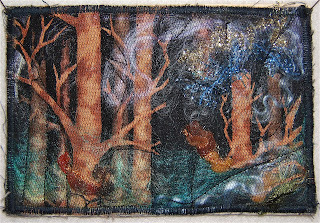 "Winter Light in the Woods"
My friend, Linda in Milwaukee, made two artist's trading cards. They each have designs on both sides. 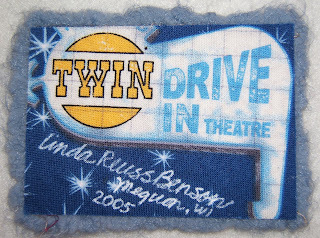 This side alludes to Linda's quilt, "Mrs. Robinson" that features the Dustin Hoffman movie on an outdoor movie screen viewed through a front windshield ... complete with various items on the dashboard (Coke in a paper cup, popcorn, and black lacy bra). 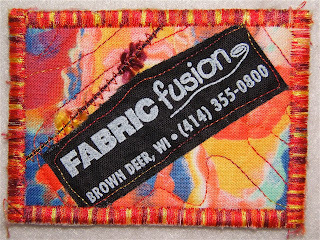 This one was an exchange through her shop, Fabric Fusion, in Brown Deer Wisconsin. 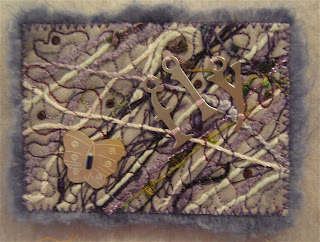 She made all the ATC's for her shop to exchange with customers ... and friends. 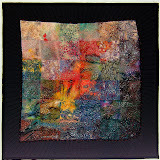 An artist friend, Karen, here in Knoxville made this card using scraps left from the silk kimonos and yarns that I had shared with her to complete a spectacular quilt. 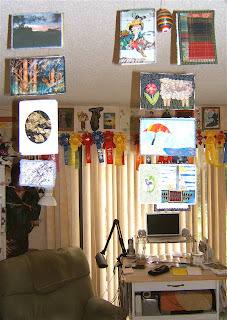 All these shared art pieces have been made into two, double-sided mobiles that hang over my cutting table. The larger mobile features the postcards from my Bee exchange. Plus there's a thread wrapped egg made by my friend, Melanie, hanging in the center. That's a lot of concentrated creative energy keeping me company in my studio. Thank you everyone. The five Art Share Memes that I participated in brought these treasures through the mail. 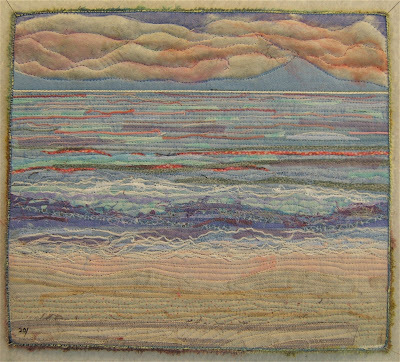 Beverly used all hand-dyed fabrics, Angelina fibers, and hand embroidery to make this whimsical folkart-like postcard. Maureen generously sent two postcards. 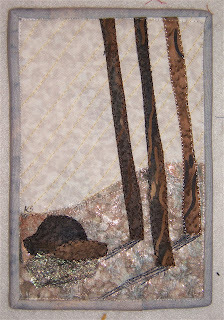 The first is collaged under tulle netting featuring cutout fabric trees and fibers on a wool background. I don't believe I'd like to venture too deeply into these woods without "protection", or at least a basket of bread crumbs. 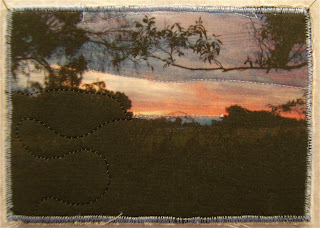 The second, a photo transfer onto fabric of a picture taken from her front gate looking west to the D'Aguilar Range. 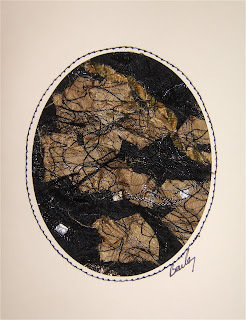 Dianna created this intricatly beautiful postcard. I can almost feel the cool depths of this shadowy forest in which I wouldn't dare stray from a path. 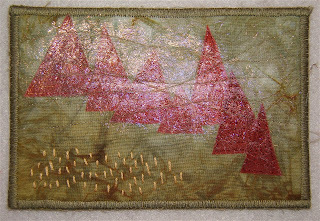 I find it interesting that all the postcard art made for me features trees. 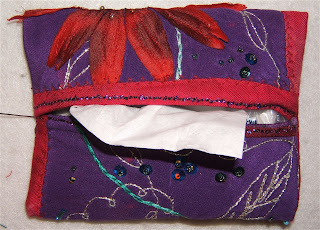 Arlee concocted an elegant tissue holder. I don't have a clue how she knew that I was missing something like this next to my "green nest" chair. 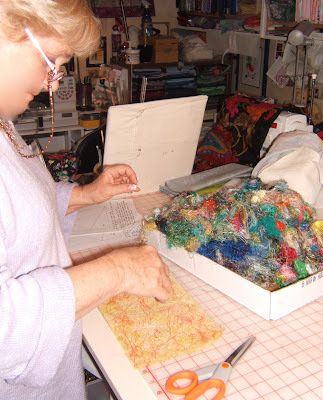 Previously, I would need to get up and go find a kleenex or have loose ones lying around adding more clutter to my hand-sewing supplies and tools on the small side table. 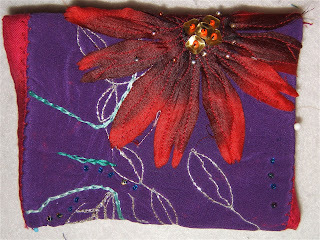 It is made of silk crepe fabric (purple) with hand and machine embroidery, plus beading. I feel priviledged that she used some of her square sequins in the center of the flower. 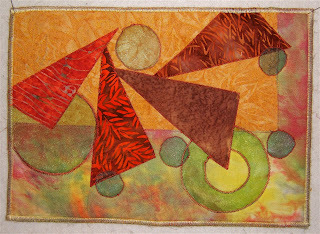 Debra made this geometric composition with hand-painted or dyed fabrics plus batiks and crystaline overlays. 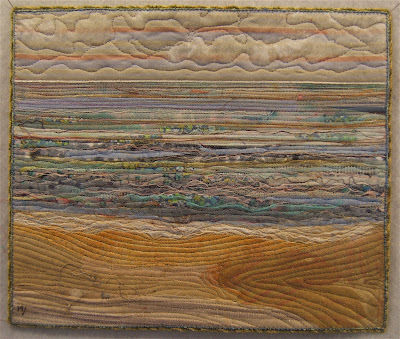 I love the art each of these talented quilters shared with me. I like having their creative energy in my studio. A big thank you to all of them for participating in the Art Share Meme. 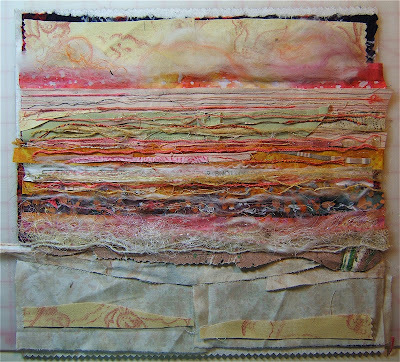 I'm honored to have "Nellie's Needles" chosen as a blog that inspires Linda of Apunti Patch in Italy. There are many weblogs that I read almost daily (links are posted in the sidebar). I wish to take this opportunity to thank all who take the time to share their ideas, thoughts, and concerns as wells as bits of their lives ... and humor. I feel connected to a world-wide community. It's like a stream of interesting friends visiting me in my studio ... giving me ideas, food for thought, something to marvel about, and even a smile or a giggle. 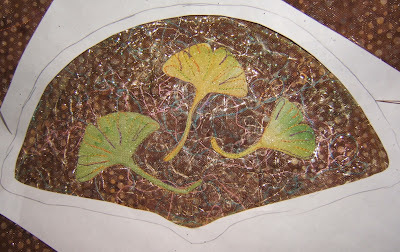 My friend, Alicia, was intrigued with the small Gingko leaf pieces that I had made last fall. 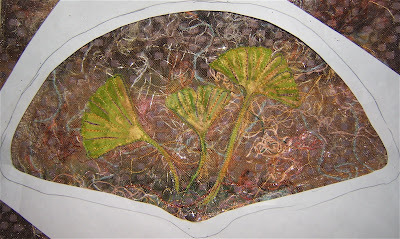 She's spent this last week in my studio creating collages with cut out fabric leaves and silk thread orts on various backgrounds. The last three pieces are designed to fit in fan-shaped frames with 10"x 6" openings. 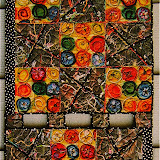 The quilts will be adhered to foam core and mounted into the frames. 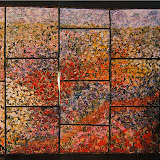 Each frame will get painted to complement the composition. 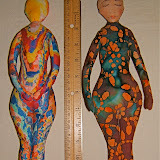 Alicia has a very strong sense of color and design. Her sewing skills are good, but do not include free-motion quilting ... so I helped out with that part.